For the Live Televised auction there are two Bid Pjhone Lines you can call, 508-297-7034 and 508-230-7071. Both lines connect you with ten (10) community and Lion volunteers to take your bids. If you receive a busy signal, that means all 10 are on the line. Please hang-up and try again. Lines are open from 2:00 - 7:00 pm or until the last item on the Big Board is sold! Best of luck to you all!! Thanks for supporting the Easton Lions and our community. All proceeds benefit scholarships, local charities and community groups and Massachusetts vision research. "Live Event Only" items can only be bid by calling 508-297-7034 or 508-230-7071 during the televised event on March 3rd from 2:00 to 7:00 pm. No "Live Event Only" items bids are accepted on the Bidding for Good site. All auction items are posted on Bidding for Good. Some new items will be added to the online auction after the 17th, so check back after the 24th for things you missed!! 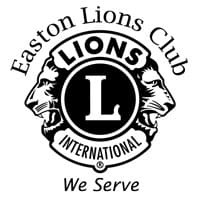 Online item bidding opened on February 17th and ends March 1, 2019, at 10:00 pm on the Easton Lions Bidding for Good site. Winners will be notified via Bidding for Good if they were the winning bidder. On Sunday, March 3rd join us for the televised live show from 2:00-7:00 pm broadcast by ECAT from Stonehill College on channels 9 and 22 and simulcast online. Phone bid line opens at 2:00 pm. Bid high to support Easton charities. Item Pick Up: Both online and live event winners should plan to pick up their items on Sunday, March 3rd from 2:00 to 8:00 pm at Stonehill College Shields Science Center. To make our annual Charity Auction a success we need lots of sponsors from all areas of the community. We thank the many local businesses and families who've donated wonderful items for this year's auction. Please support all our sponsors by selecting their logos on our Auction Sponsor page. We also accept Cash Donations. Donations of $100 or more will be recognized during the Live TV Auction on March 3rd. Live TV Board sponsorships are available for a donation of $350 or more. To be a sponsor please contact Steve Hoffman or Dale Kerester at auction@eastonlions.org. What is this that I hear about an online auction? We will be selling selected items during the online auction only. This year the online auction will feature some items valued over $100. When donors give multiple items of the same value, one is posted in the online auction, the other is on the TV auction. So take advantage of the opportunity and start bidding Feb 17th on items like a VFW Hall rental ($250), and Easton Braces - Mark Halvorsen DMD Certificates ($1,000). Online bidding starts February 17 and ends Friday, March 1. All online bidding ends two days before the live auction. We encourage all winners to please pick-up physical items at the Stonehill College Shields Science Center on Sunday during the live auction March 3rd from 3:00 to 8:00 pm. If you cannot pick-up the item, because you are out of state, etc.) and need to have it shipped to you, you will need to pay an additional shipping and processing fee (which will be processed after the close of the online auction). How do I bid for the items being sold online? It's easy from here. Go to the auction website at Bidding For Good or click the blue button at the top of page “View All Items on Bidding for Good”. This brings you to the live auction site where you can “Register to Bid” or login if you have an account. Click on the "Online Only" link in the left sidebar (see image). The categories below the left side bar now have only "Online Items" that may be bid on. Sorting in "Image View" is done by using the "Sort by:" drop-down box. Sorting in "List View" is done by selecting the column heading. 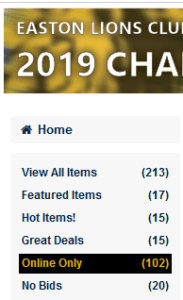 If you want to see all items, including those available at the Live Auction on March 3rd, select the "View All Items" in the left sidebar. Items labeled "Live Event...", can only be bid on by phone (508-230-7071) during the live auction. If you have any problems, please email auction@eastonlions.org. I'm the winning bidder! How do I get my item(s)? Winning bidders pick up their items on the day of the live TV Auction, March 3, from 3-8 pm. To the extent that you cannot pick up the item (because you are out of state, etc.) and need to have it shipped to you, you will need to pay an additional shipping and processing fee (which will be processed after the close of the online auction). Confirmed winning bidders must pick up their items on the day of the live TV Auction, March 3, from 3-8 pm. How do I find special online bidding items? Some items can ONLY be bid on from our Bidding for Good online auction. Items in the online auction include duplicate items where one is available for bidding online while the other is on the TV auction March 3rd. 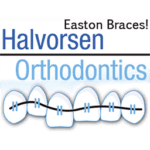 For example Dr. Mark Halvorsen Orthodontics, Easton Braces has two certificates valued at $1,000. One online with the winning bidder on March 1, the other on the Big Board on March 3. You will also find many items online under $100 in value and include many local restaurants and business. When is the Live Televised Charity Auction? The live televised auction will be broadcast by ECAT using local channels 9 and 22 and simulcast online on March 3rd from 2:00 to 7:00 pm. Item values range from a low of $20 up to $6,050 for the car. Online bidding is NOT available via idding for Good for the live TV auction. These items can only be bid on by calling 508-230-7071 on March 3rd. When can I start to preview the items? The item administration & website team expect to have most items available for viewing by February 17th at 8:00 am. Additional items may come in through the end of February and will be posted as received. The online auction ends two days before the live auction. Please check back regularly for late arrivals. All items on the live televised auction will be available for preview at Stonehill College at the Shields Science Center on Saturday, March 2nd, from 2:00 to 4:00 pm. Do we need more donations? Donations must be in by February 24th to be in either our online or live televised auction. Our solicitation team has been hard at work bringing in wonderful donations from many generous donors, but we always welcome new donations! Maybe you know someone who has some sports tickets? Tickets to an upcoming show? Or maybe a vacation rental? How about dinner with a local personality? Special parking spot? We can use them all, download our donation form here or contact Steve Hoffman at auction@eastonlions.org for more information. Make sure to submit the donation form (and any changes to the script) along with the item or certificate (if the donor is submitting their own certificate rather than having us create the certificate). Remember, the earlier the donation comes in, the more exposure the donors gets on our auction website. Any questions? Contact Steve Hoffman at hoffman5000@comcast.net or send an email to auction@EastonLions.org. How is all of this happening? It's happening through the incredible team of Lions members and friends who have been working their Lions tails off! Putting on a live televised auction is no easy feat, and we are fortunate to have a dedicated team who devote their time, efforts, and talent to make it all come together. Thank you all for your hard work!! Select map to view auction parking/entrance for item pick-up.